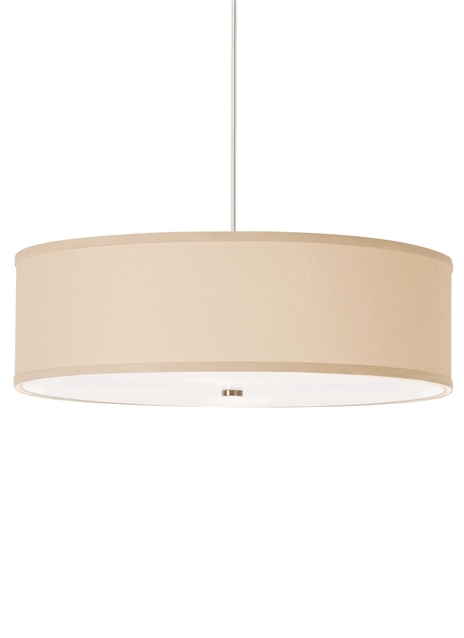 The Mulberry Pendant light by Tech Lighting is classic and sophisticated with its short fabric drum shade and round canopy. A white glass diffuser conceals the lamping inside while providing a glare-free wash of light onto surfaces below. Also available in the Mulberry family is the Mulberry Ceiling, simply search for Mulberry Pendant to find its closest relatives. The Mulberry is available in two traditional colors, Desert Clay and White, and is finished with Satin Nickle hardware creating an overall clean, classic visual appeal. Mount this contemporary fixture in places such as hallways, bathrooms and closets. Available lamping options include energy efficient LED and no-lamp allowing you the choice to light this fixture with your preferred lamping. All LED lamping options are fully dimmable to create the desired ambiance in your special space. Rated for (4) 75 watt max E26 medium base lamp (Lamp Not Included). LED (4) 120 volt 9.5 watt, 800 delivered lumen, 2700K, medium base LED A19 lamps. Fixture is provided with six feet of field-cuttable cable. Dimmable with most LED compatible ELV and TRIAC dimmers.